RON PEETERS, executive vice president of Xytech Systems Corporation, reports. he broadcasting industry and its content providers are increasingly utilizing ﬁle-based media (“digital media”) from acquisition through post production, distribution and delivery. This trend has affected how they manage media assets and associated production, post production, and distribution workﬂows. As the industry transforms from physical to digital assets, opportunities open up to generate incremental revenues and service new distribution channels with content customization and asset repurposing. It means quicker time to market through electronic delivery while increasing productivity and elevating ROI. However, physical assets will be around Most broadcasters and content providers have a need to automate workﬂows, where applicable, via enhanced workﬂow and process management tools; integrate workﬂ ow solutions with autonomous and semi-autonomous production and postproduction systems; and integrate workﬂow solutions with digital asset management (DAM) and media asset management (MAM) systems. The most common response to handling digital media has been to deploy a digital asset management (DAM) system. Such DAM systems provide a central repository for digital ﬁ les and can archive, search, and retrieve digital content. However, DAM systems have a tendency to be digital-asset centric and support digital assets only. While they are increasingly integrated with core systems through APIs for data sharing, they have minimal to no business workﬂ ow integration. In talking with international broadcasters, major television networks, studios, and larger postproduction houses, the consensus is that DAM systems have great capabilities for storing and maintaining digital assets, but fall short in handling the integration with the daily business workﬂows and project logic. What they need are business process capabilities that can extend from physical assets to digital assets – or so called digital asset workﬂows (DAW). A DAW system provides the integration between physical and digital asset management systems through transaction-based business workﬂow processes. Therefore, DAM systems and DAW systems complement each other, where the workﬂow and orders drive the job or project and can work with or retrieve assets from the DAM storage system. A DAW system automates almost the entire process from the start of the project to getting content ready for delivery. It not only allows the integration of digital and physical asset management systems but also ties the related business logic and workﬂow into the business operations. 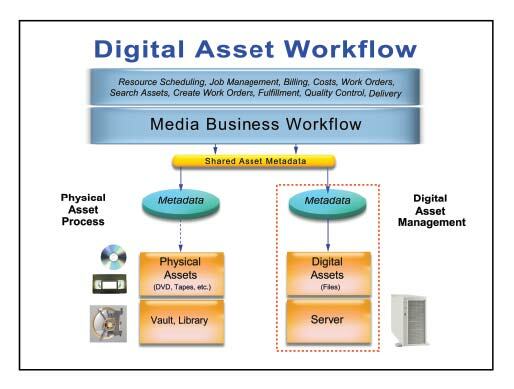 In a uniﬁed media business workﬂow, the asset metadata is shared for the physical and digital asset processes – for a long time as huge libraries have been built over many decades. Often it makes ﬁnancial sense to only digitize the most popular titles that are in high demand while maintaining the majority of the assets as physical media. There is also a preservation and recovery consideration since physical assets are a proven industry standard with a well-developed global infrastructure. transparent access and federated management of physical and ﬁle based media assets – even though from a business workﬂow standpoint there is little difference. From a broadcasting perspective, it does not matter if an asset is in physical media or digital media, as long as it can be found, repurposed, and delivered out. something everyone wants, but only a few have been able to effectively attain. Integration with any DAM system as the digital media repository. Integration of workﬂow processes via Web services across complementary applications from multiple vendors. Minimal complexity for execution and automation of the steps from order to job/project and media content delivery. Transparency and control over digital workﬂow steps (such as, ingest, transcode, and watermark). Flexible transition from physical to digital assets and manual to automated processes an end-to-end workﬂ ow process. Workﬂows agnostic to solution providers, thereby allowing media companies to maximize their current investments and automate their business workﬂows. Deploying a DAW system leads to improved operations efﬁciencies, better asset utilization, elevated productivity, more timely delivery of media content, and better utilization of equipment and facilities. Consolidating libraries and metadata. International broadcasters have traditionally been challenged with both acquisition of content and the management of enormous asset libraries. One of the largest broadcasters in the world has several million titles and is now going through a major project to consolidate physical libraries and related metadata for all these titles in a single company application. This forms the basis for further integration between the physical and digital asset workﬂows. Automating manual processes. Many organizations maintain media content schedules, digital ﬁles locations, and other work elements in a rudimentary manner. A major TV network has maintained its digital assets and non-linear business workﬂows with in-house developed software tools and manual efforts. Recognizing the synergy between digital and physical media, it is in the process of migrating its digital asset operations and on-air operations to be included in its core business workﬂow systems, which already handle the physical assets and linear business operations today. operations, which are centered on physical assets and business workﬂow, while deploying DAM systems for digital media. Starting in 2007 they are on a path to integrate their disparate DAM systems with a federated business workﬂow and asset management application. This means that processes that involve either physical or digital assets are driven through a uniﬁed media workﬂow. • Integrating External workﬂows. With more uniﬁ ed workﬂows and asset management coming about, the next frontier is to automate and integrate with content providers. For example, one major studio has already tied its asset libraries and business work-ﬂows to its key vendors and not only has visibility into the vendors’ libraries but also can initiate work orders and projects from within its system for these content providers. The bottom line is that the world has been changing and technology is ﬁ nally starting to catch up with how broadcasters and content providers would like their business to work: with an integrated, uniﬁ ed workﬂow approach towards physical and digital assets and uniform automation of business processes for media content acquisition, postproduction work, and content delivery. Such an agile infrastructure provides the ultimate foundation for timely delivery of media content to ever-changing existing and new revenue opportunities and distribution channels.